Oh, how we look forward to this event each year. It puts the FUN in fundraising!!! So go get your ticket to support the Nina Haggerty Centre for the Arts...eat some cake...drink some wine...watch some hilarious performances...and cheer on our cake, darn it! Two years ago, we got third place...last year we got second place...this year? Well, let me just say that Ais, is coveting the top spot pretty badly! Ha ha. 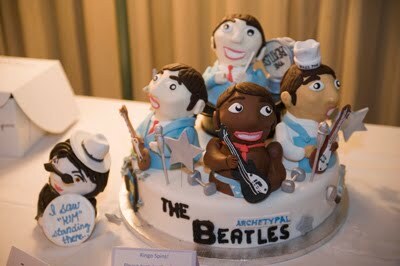 This was the cake that gave our sponsor, Avenue Magazine a second place win from last year's event...you see Ringo in the back there? Ken was able to make him SPIN around while playing that drum...COME ON people!!! Background story: Beatles song that was given to us was "I saw her standing there"; our stage team members were Orville (Avenue Magazine); Jesse Lipscome; and Ken...with the ever so funny talented Sheri Sommerville singing our song. If you haven't caught on yet, our cake represented each of our team members...hence, the Archetypal Beatles...because Aislinn and I are soooo funny and creative! I can't tell you what song we got this year...not until the event is over, but I can tell you that it's going to kick serious A**! ...now, if I can only find the video footage from last year's stage performance. IT was too funny! PS. watch us bright and early on City TV's Breakfast television this Monday October 25th to promote cake walk!